Every year I like to make my own Christmas gift tags, especially for my crafty pals who appreciate them. In fact, my friend Wendy has kept all the tags I’ve made her over the years and hangs them on the tree. If you have been following my blog you will know that I have a thing about denim and it’s been nearly 2 months since my last upcycled jeans project; my denim suitcase. 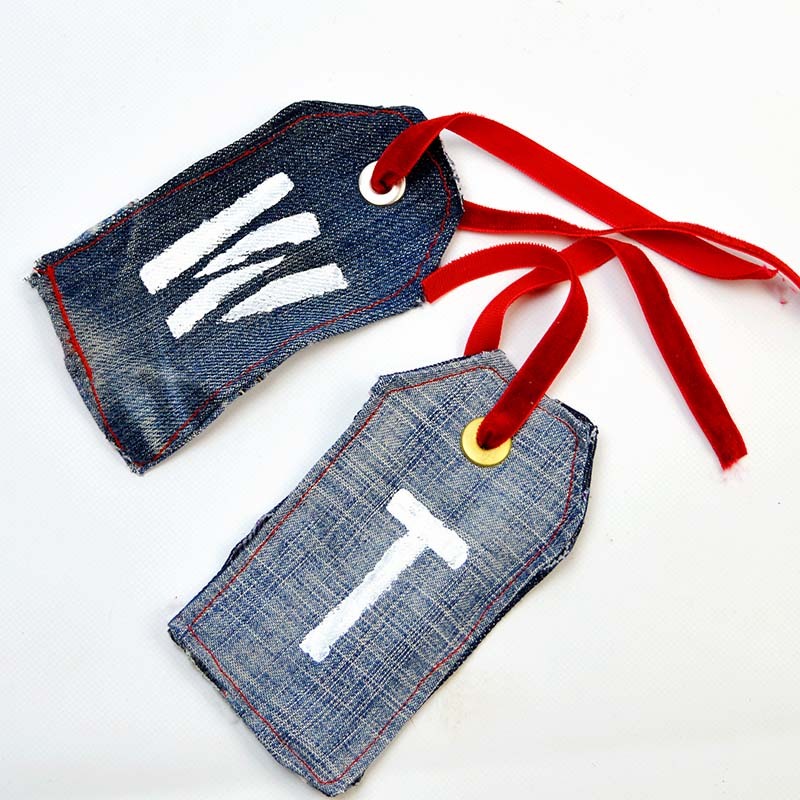 So as I’m suffering from a bit of denim withdrawal, I’ve decided to make a denim gift tag this year from upcycled old jeans. 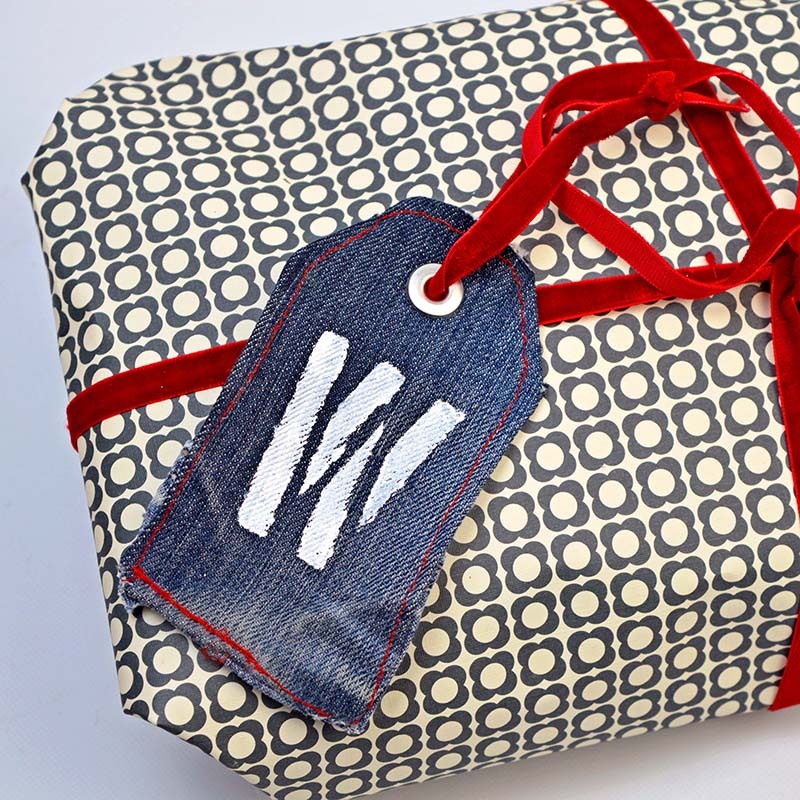 You may think that working with denim is a bit of a faff for a gift tag, but they aren’t just gift tags. 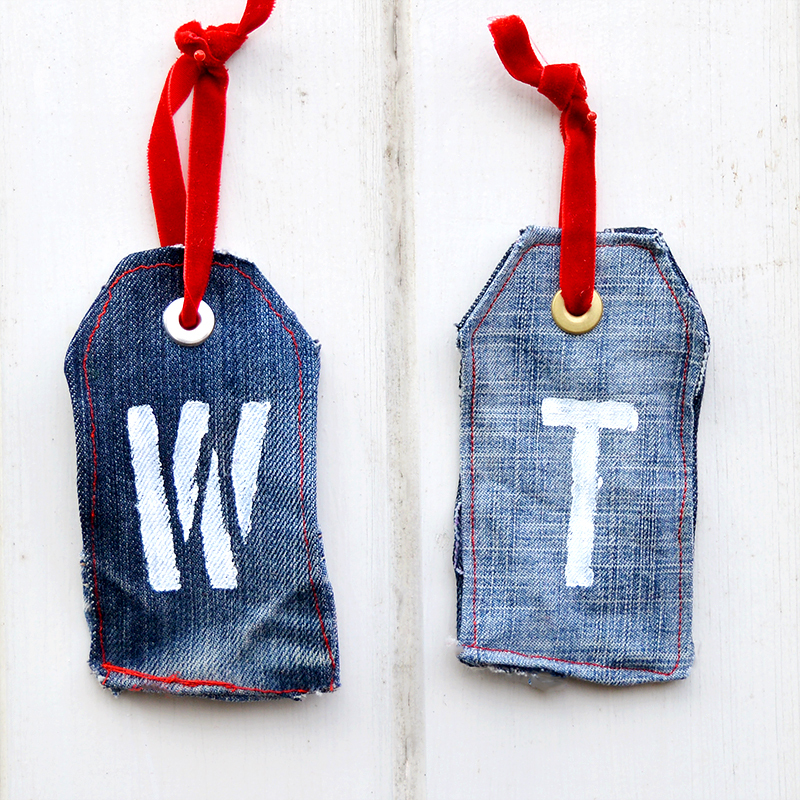 The monogrammed denim gift tags almost become a gift in themselves. They can be used as a decoration, a key ring, and a bookmark afterwards. Scraps of denim from old jeans, shirts etc. I find that the softer more worn pieces of denim are good for this project. Using an old luggage label as a template cut 2 pieces of denim for each tag allowing for a 5mm seam. I used denim in 2 different shades for each tag one light and one dark. Iron your 5mm seams down. If you snip the corners you will find this easier. Pin your two contrasting denim tag pieces wrong sides together. Then sew them together using a sewing machine, it is possible to do this by hand but it is much quicker and easier on a machine. Use your eyelet tool to punch a hole and to place an eyelet rivet in your tag. 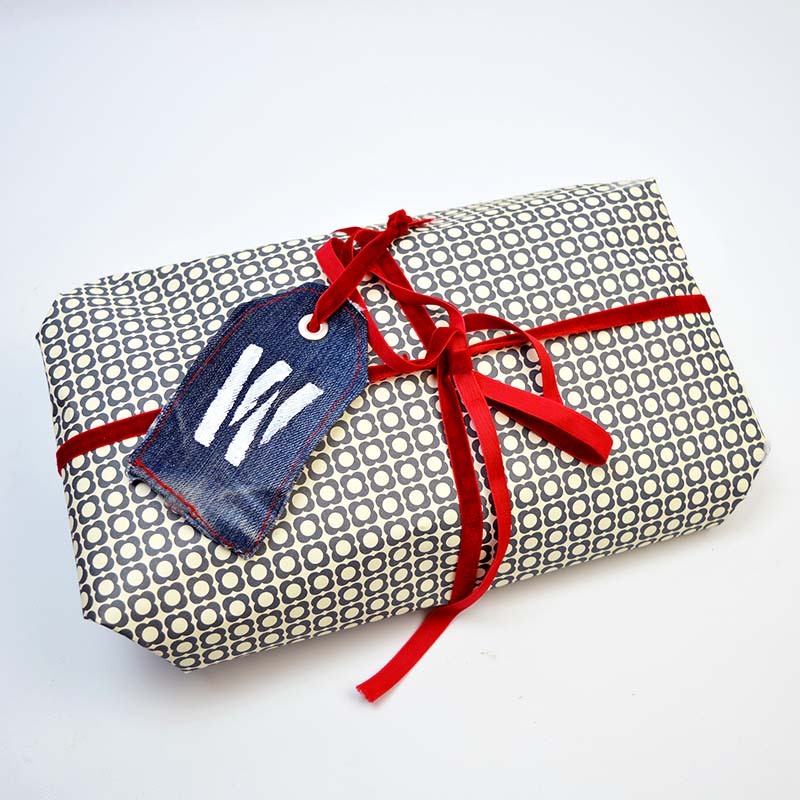 Finally to personalise your gift tag, paint the recipient’s initial on to the tag. I find that white paint works well. 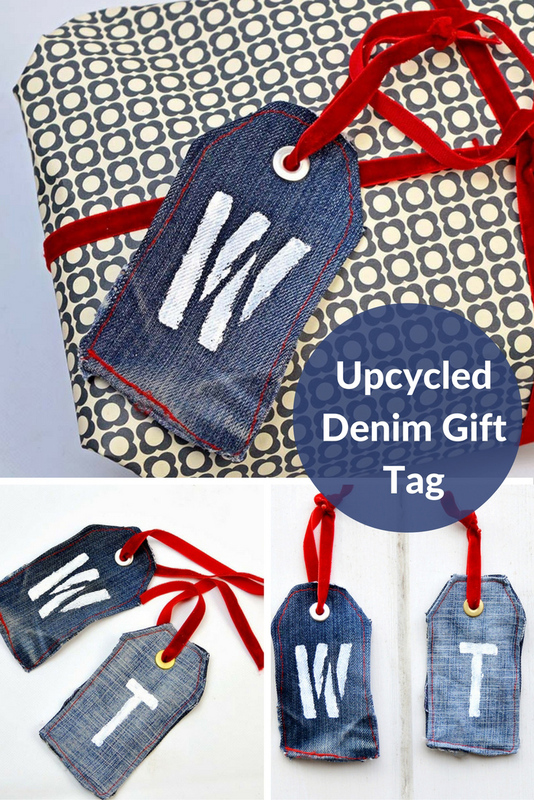 All you need now is a bit of ribbon and your unique denim gift tag is finished. 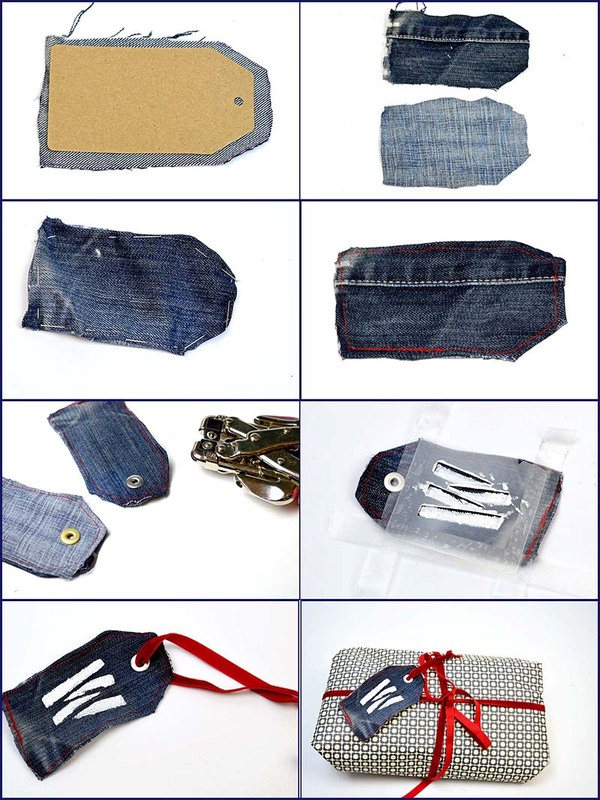 You might want to check out my DIY postage stamp tags and my denim pocket organiser. For more upcycled holiday gift ideas visit allfreeholidays. What a cool idea, Claire. They could also be used as bag tags. I really must investigate adding rivets. It’s been years since I’ve done that. Thanks ! Yes they would make great bag tags and rivets are really easy and great for so many projects. I’ve featured your blog and gift tags today, Claire. love love love! And the fact that Wendy has kept all your tags, really wonderful. thanks so much for sharing on craft schooling sunday, great to reconnect! Thank you ! Glad that craft schooling is back. What a terrific idea! These are really adorable! I love this idea! I’m also always looking for new ideas for recycling old jeans. I’ve used them to make Christmas stockings, and I’ve made a denim throw pillow. I plan to make more pillows using old jeans soon. Thanks for sharing at the Submarine Sunday Link Party!! Thank you ! Old jeans are fun to work with and I think they look great when upcycled. Thank you very much I look forward to seeing and the rest of the craftgossip features ! Thank you ! I loved your stencilled denim stool. I also made some denim Unionjack bunting for the queens jubilee in 2012 ! Oh wow I love this, and your postage stamp tags! I’ve run out of time to do this sort of thing this year but will definitely think of it for birthdays! Thank you ! Yes both tags can be adapted and made as Birthday tags or for other occasions. Cheers and Merry Christmas. Very cute jeans tag, and I love all of the tags you’ve made for your friend. How creative and thoughtful! You’re friends must feel very loved. Thank you ! That’s my favourite part of Christmas; it’s one big excuse for a lot of crafting. I love to make my own tags and the challenge of thinking up new ones each year. That’s a really cute idea. I have a bag full of old jeans as I thought one day I might make a denim quilt (that is looking less likely as the years pass!) I love that your friends keeps them, I have a friend who keeps the Christmas cards I make for her and puts them up again every year! It’s nice to make things for special friends who really appreciate them. Thank you ! I made a denim quilt a couple of years ago and love it, it sits on our bed. You should make a denim quilt it is well worth it. Merry Christmas ! O K A Y ! You have reached me JUST IN TIME for Christmas! Thank you so much for sharing this great idea at Making Broken Beautiful this week, I will most certainly be using this idea on my own family’s presents! I have been looking for something simple that’s easy to do with a large impact and I do believe i’ve now found it! Have a very Merry Christmas! Thank you so much ! 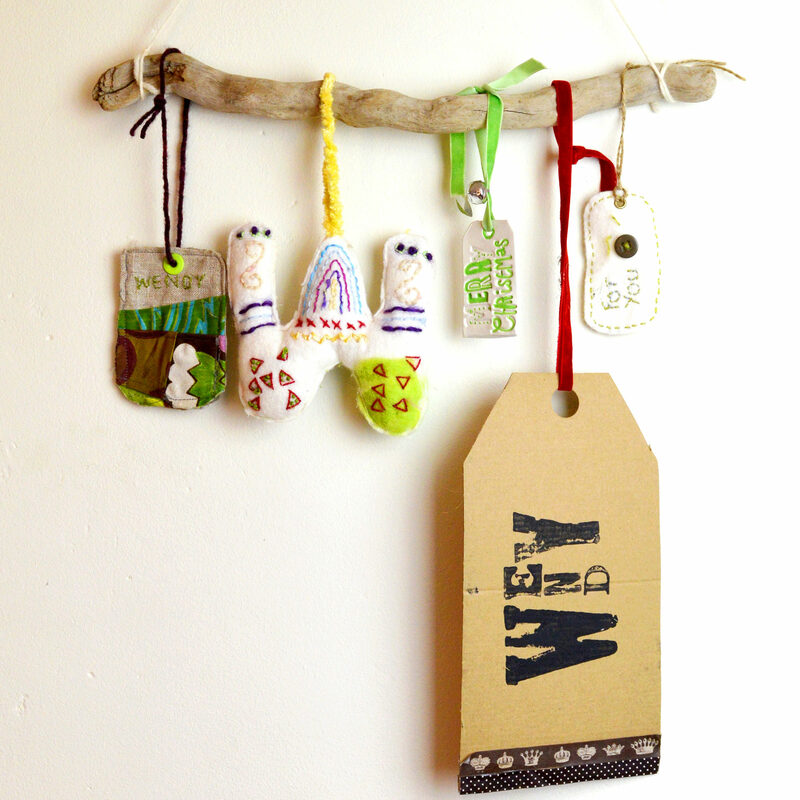 They do make a lovely keepsake tag that can be reused as a bookmark or bag tag.